North Ayrshire has become the first area in Scotland to hire a full-time counsellor for each of its high schools in an attempt to improve mental health. 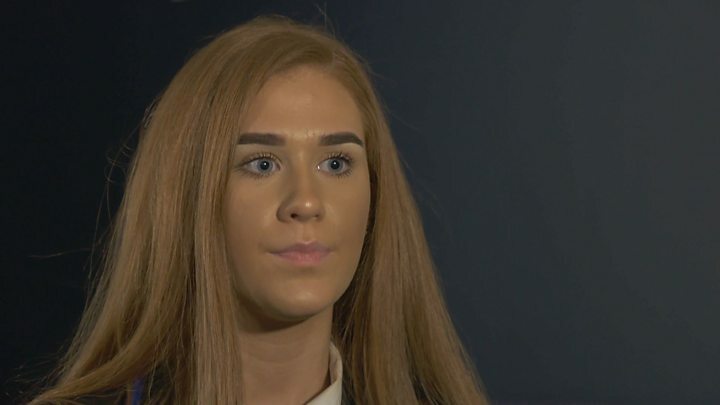 BBC Scotland's The Nine has learned the initiative has been rolled out to try to cut the number of young people taking their own lives. School-based counsellors deal with cases including substance abuse, self-harm and depression. It is hoped early intervention can help reduce distress and prevent suicides. Councillor Robert Foster claimed North Ayrshire had one of the highest rates of youth suicide in the country. He said: "The counsellors are available at school times or after school. "They talk to pupils about a huge range of issues affecting them." A report by the local authority's chief social worker said a raft of actions were being taken to help children who may be at risk of taking their own lives. It said: "As a response to recent child suicides the Child Protection Committee set up a strategic suicide prevention group ... to reduce the number of incidences of suicides by young people". The cost of delivering the counselling service in each of the nine secondary schools in North Ayrshire was £319,069 in 2018/19. The money comes from Scottish Attainment Challenge funding. North Ayrshire claimed the move avoided the need for young people to go on a waiting list, improving chances of dealing with problems sooner. Calum Johnston, the head teacher of Auchenharvie Academy in Stevenston, believes the counsellors are part of a wider, collaborative approach involving charities such as See Me. Mr Johnston said: "More and more of our young people, particularly males, are coming out of their shells and are beginning to talk more about the issues they are going through. "I don't think there is any doubt it (this scheme) will save lives". In 2017 a BBC investigation found more than 250,000 children in Scotland had no access to school-based counselling services. It found that 14 local authorities had no on-site counsellors and provision by other councils was irregular. North Ayrshire only had two counsellors in nine of its secondary schools at the time. In the 2018 Programme for Government, First Minister Nicola Sturgeon announced £250m of funding across the next five years to support mental health services, in particular for young people. This includes £60m for schools, supporting 350 counsellors and 250 extra school nurses, to ensure every secondary school has a counselling service. The Scottish Association for Mental Health (SAMH) praised North Ayrshire for leading the way. Public Affairs Manager Carolyn Lochhead said: "I think it is going to have a really big impact. We know from Wales that school-based counselling does help children. "It helps to reduce their distress and most cases are dealt with without needing to be referred on. "It means the case is being dealt with there and then and they don't have to go in to NHS services." A total of 680 people killed themselves in Scotland in 2017, a rate of 12.5 per 100,000. This is largely unchanged over the past four years, with an overall downward trend over recent years from a rate of 18 per 100,000 in 2002. This represents a 20% reduction over 15 years and ministers are now targeting a similar fall over the next four years. Stephanie Belshaw is the counsellor for Auchenharvie Academy in Stevenston. She said: "I see roughly about 20 pupils every week. Roughly four a day. "That can be quite consistent depending on if anything comes up. "For example, yesterday I had a student that I had to squeeze in in the afternoon and then have a meeting with the parents after." Lewis Thomson, 16, is a pupil at Auchenharvie Academy. He said: "Definitely it will help to save lives and help people improve quality of life. "It will make them feel more themselves and not have to put on a character or façade in front of others." Fellow pupil Karis Keane, 17, said: "I think it has made a huge difference. It has begun to eliminate the stigma that it is OK not to be OK.
"We are allowed to have bad days. The service is there and we all know it's there. Even if we don't use it then we know if we have any problems we can go and use it."